Plus our exclusive 10-second interview with Stewart in Hell! It’s a cinematic dream come true! 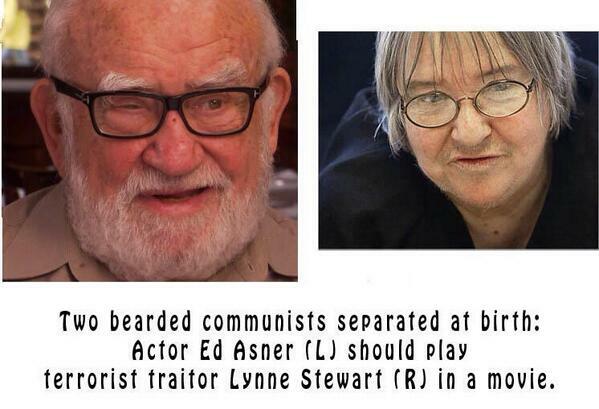 Communist fellow traveler and actor Ed Asner will be cast as the now-moldering communist Lynne Stewart in an upcoming HBO movie, Hollywood insiders announced. Years after this writer created the admittedly amateurish separated-at-birth graphic above, Asner, a card-carrying member of the Marxist group, Democratic Socialists of America (DSA), finally gave in to industry pressure to portray his doppelganger. He plans to donate his salary from the movie to former President Obama’s Organizing for Action (OfA) group because he supports its goal of overthrowing the venal Russian sockpuppet, President Donald Ivan Trump. Contacted at her new palatial estate in Hell, Stewart was ecstatic. “Ed’s a dreamboat,” she sighed.